As part of an ongoing series, EURACTIV France is profiling major candidates in the 2012 French presidential elections, analysing in detail what their political action, programmes and policies mean for the European Union. We start with Marine Le Pen, leader of the far-right National Front. Click here to read the original version of the profile of Marine Le Pen on EURACTIV France. For the first time in its history, France's far-right National Front (FN) will not be represented by its founder, Jean-Marie Le Pen at the French Presidential elections. If his daughter Marine has softened some aspects of the FN's traditional positions and attained a degree of respectability, on one subject the objective has not changed: The European Union must be destroyed. Marine Le Pen is in her second term as an MEP but her actions in Brussels have been limited. In eight years she has written no reports, has asked only four written questions to the Commission, and has intervened only 56 times during debates. Her rate of absenteeism from Parliament's plenary votes is one of the highest, at 42% for 2004-2009 and 38.3% since the last elections. However, Magali Balent, a professor at Science Po and a researcher at the Institute of International and Strategic Relations (IRIS), says this is not necessarily a disadvantage for the FN's leader. "To be an MEP allows her to … prove to the voter that she can be credible, integrated into a system, take positions, have a strategy. Beyond that, what she actually does or does not do, is not important to the voter. Especially since Marine Le Pen's voice is extremely weak in an assembly where her school of thought is in the minority," she said. The change in the National Front's leadership has opened up opportunities for it to work with other nationalist European groups. "In Jean-Marie Le Pen's time some parties did not want to work with us. Like [the UK Independence Party]," said Ludovic De Danne, a close aide. He added "as soon as Marine Le Pen became president of the National Front, relations with other parties were re-evaluated". In 2010 a pro-independence platform was created, the "European Alliance for Freedom," which includes the FN as a member. Its president is Godfrey Bloom, a UKIP MEP who made waves in November 2010 for interrupting Socialist German MEP (and current president of the Parliament) Martin Schulz with a cry of "Ein Volk, ein Reich, ein Führer", going on to call him an "undemocratic fascist". Contacts continue and some FN members hope a genuine political group can be created before the 2014 European elections. In the European Parliament, the "friends" of the National Front are so few that its three MEPs do not belong to any political group. In 2007, a formal Group was created called "Identity, Tradition Sovereignty". However, it broke up when the five MEPs of the Greater Romania Party withdrew because of harsh statements against Romanian immigrants made by one of the Group's members, Alessandra Mussolini, the granddaughter of the Italian dictator. The FN also has longstanding ties with the Flemish-Belgian nationalist-secessionist party Vlaams Belang (Flemish Movement, VB). An FN spokesperson has said that the two parties "converge in areas such as immigration, the fight against crime, and the 'Islamisation' of Europe". The FN has good relations with the Lega Nord, an anti-immigrant Italian political party which campaigns for the autonomy of northern Italy. Last year, Le Pen visited the Italian island of Lampedusa – which was a focal point of uncontrolled immigration from North Africa – with Lega MEP Mario Borghezio. Borghezio has said Europe must "remain white and Christian" and has praised the political writings of Norwegian terrorist Anders Behring Breivik. More recently, Le Pen attended a ball of far-right organisations in Vienna organised by 'Olympia', which includes members of the "Party of Freedom" (FPÖ). In 2000 the EU implemented sanctions against Austria when the FPÖ was allowed to participate in government. In contrast, the FN has officially broken ties with some right-wing organisations such as the "Belgian National Front", a minor party modelling itself on the French one, and the Jobbik party in Hungary. Jobbik is known for its uniformed militias, intimidation of Roma, and territorial demands. Contacts between the FN and Jobbik in the European Parliament remain however. Marine Le Pen herself has frequently courted controversy with inflammatory language regarding Muslim French citizens and immigrants. In December 2010 she compared Muslims' praying in the streets to the Nazi occupation of France saying, "For those who want to talk a lot about World War II, if it's about occupation, then we could also talk about it, because that is occupation of territory". She has also used such rhetoric in her presidential campaign. At a congress of the National Front on Sunday (21 February), Le Pen claimed all abattoirs in the Paris region produced halal meat in accordance with Muslim practice, considering it proof of the French government's bowing to "Islamic radicals". The main French meat industry association, Interbev, denied the claim. Struggle against the European Union is one of the pillars of Le Pen's political vision. Shortly after her election as leader of the FN she said she fights "with all her strength" against the EU and that it is "a structure that I consider totalitarian, it is the European Soviet Union". 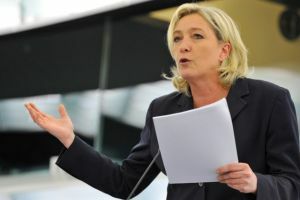 In a speech presenting her electoral programme in November 2011, Le Pen compared the EU to a "rootless … impotent empire" which deprives the French of their identity and has "pillaged" national sovereignty "for the benefit of a techno-structure feudalised by the markets". While Le Pen has called herself "European" in opposition to the rest of the world, she considers French political class's dedication to European integration proof of its lack of patriotism. Le Pen recently confirmed on French radio that she wants to have a "patriotism test" at the National School of Administration (ENA, a university from which much of the French political elite is drawn). She has also suggested banning the flying of EU flags from public buildings. "Now that the whole of our political elites have become Europeanist and consider France outdated, that its structure must be diluted for a European structure … I indeed think that it is time to recruit high civil servants who believe in France and defend their country," she said. For Balent of Sciences Po this is nothing new: "Jean-Marie Le Pen had his own expressions like 'Brussels federasts' or 'Maastrichters'. There is only a moderation in terms." Le Pen claims the common currency is destined to disappear and has been nothing but a burden imposed on the peoples of Europe: "Today, we are trying to save the euro at any cost, but at was cost? I do not want my people to be forced, like the Irish, to lower the minimum wage by 12%, to reduce family allowances, to lower unemployment, to lower the remuneration of civil servants." If that is the price which must be paid to save the euro, well then I say that is better to leave Europe and better to leave the euro," she added. For the FN's leader, the Greek, Portuguese and Irish rescue packages are only "pure madness", symbolising not European solidarity but submission to "the banks". She promises that as French president "not one cent would leave France". As to the new European Treaty on fiscal discipline, she describes it in a 31 January press release as "anti-democratic", "anti-economic" and adopted "by order of Germany". She promises to revise French participation in the Treaty if elected, citing non-signatory countries the United Kingdom and the Czech Republic as examples. National sovereignty being at the heart of her political thought, the candidate considers that its powers and competencies must be completely repatriated to Paris. The arrival of the National Front to power would not have as its only consequence the return to the franc. European cooperation would be limited to that between national governments, industrial projects like the Ariane rockets and Airbus are often cited as examples. The FN also wants French law to once again take precedence over European law. According to the party, "at least 80% of important national laws and regulations are but only the transposition of [European] norms and directives". This figure is doubtful, as EURACTIV France showed in a 2009 investigation. Le Pen would create a "ministry of Sovereignties" to repatriate powers to the French government. The Common Agricultural Policy, the biggest single part of the EU budget and of which France takes up 20% of its €50 billion annual budget, would be abolished. In compensation, the FN would propose the creation of a "French agricultural policy … financed by the reduction of the general contribution to the European budget". The FN claims entirely withdrawing from the EU would lead to net savings of €7 billion corresponding to the (the difference between France's current contributions and returns to and from the EU budget). However, French agricultural exports would likely suffer greatly due to the reestablishment of national borders. To undo the existing European Union, France would have to renegotiate and persuade its 26 partners that the Europe proposed by the FN is the better one and that 60 years of compromise must be erased. "France will stick to her doctrine in case of failure of negotiations," says Le Pen's 2012 programme. Sanctions could then be taken against France for failure to respect its legal commitments to the EU. The Lisbon Treaty, the EU's basic law, does have an article allowing for members to unilaterally withdraw but the FN is reticent to use it. "Article 50 is the final weapon, it will only be used if the other countries do not respect the choice of the French," said De Danne. Given France's importance in the bloc, the FN insider is bullish as to the country's bargaining power: "If we leave, the EU is finished." The FN would end the free circulation of goods and persons by reinstating customs barriers, without detailing what the economic consequences this would have. If a hypothetical Le Pen government were to claim the right to tax imported products from EU members, nothing would prevent the latter from doing the same to French exports. The party's programme would also undo the free circulation of persons, allowing for increased national control of immigration, but also preventing French citizens from travelling freely across the Schengen Area. With slogans like "buy French" and "the French first," the FN candidate, like her father, has made national preference one of the pillars of her programme. It implies that citizens of other European countries would no longer be treated equally with French citizens in employment, housing and social aid. This proposal also goes against European law's principle of non-discrimination within the Union for persons and products. Marine Le Pen's programme has at its centre France's withdrawal from the eurozone. For the nationalist leader, the common currency is the main cause of the country's economic problems. Nonetheless, despite her lyrical flights of fancy, she is cautious. She says she wants to "organise" the end of monetary union by negotiating it with other member states. She is convinced that other countries will follow the French example because, in any event, the euro is doomed. By recovering monetary competencies, Le Pen is certain to be able to put France back on the road to growth even if her programme does not bother to factor in the cost of returning to the franc. According to her, this "would in no way provoke the cataclysm describe by the ideologues and other fanatics of the common currency". The centre-left think-tank Terra Nova estimates the cost at €50 billion by 2013 and a loss of 5% of GDP over 18 months. Le Pen's programme could be a handicap for her in a country where a majority continues to support the euro and European construction. According to December 2011 poll, only one third of French say they are favourable to a return to the franc. For Balent, "her opposition to the common currency could be an obstacle to her electoral success, except of course, if the future proves her right." "However her statements on the EU as such – technocratic, distant of the peoples, that does not protect and encourages the loss of identity – speaks directly to people. She plays on existing fears. In that sense, her rhetoric resonates in this time of crisis." A crisis which EU leaders have thus far struggled to remedy. The National Front is France's leading far-right political party, known for its nationalism, and hostility to immigration and European integration. Marine Le Pen, an MEP, became the party's president in January 2011. If her chances of winning both rounds of France's 2012 presidential elections are virtually nil, there is the possibility of her knocking out President Nicolas Sarkozy or Socialist candidate François Hollande in the first round (her father did so against Lionel Jospin in 2002). Recent polls say she would receive 15-20% of the vote, slightly better than the FN's usual performance. The party's programme, even if not implemented, gives some indication of the extent to which anti-EU ideas resonate in one of the Union's most important founding members. There is also the possibility of parts of her programme creeping into that of a centre-right government eager to court the FN's voters. Sarkozy's interior ministers, formerly Brice Hortefeux and now Claude Guéant, have faced periodic controversies for alleged racist statements and policies (such as last 2010's Roma controversy), normally the preserve of the National Front. French voters,please ,is important for us all that you get a deep good political information.